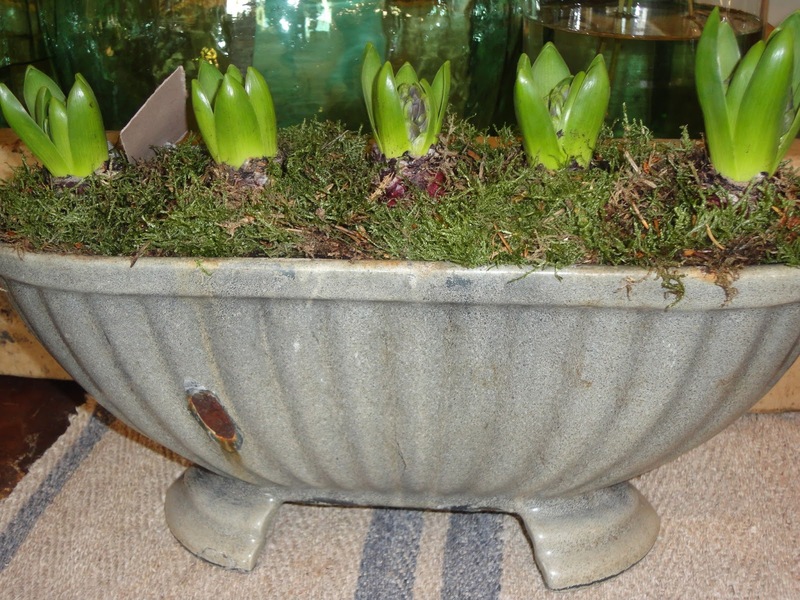 Pretty indoor displays of Spring bulbs planted in birch pots and mossy pots. A really useful little cupboard that would suit any room. 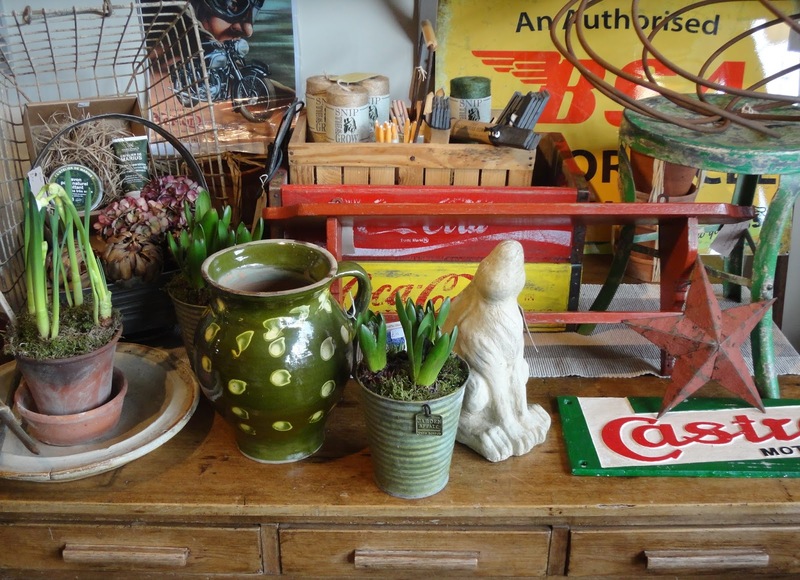 Displayed here with a French side table, an old Tekno bowl and few new French finds. 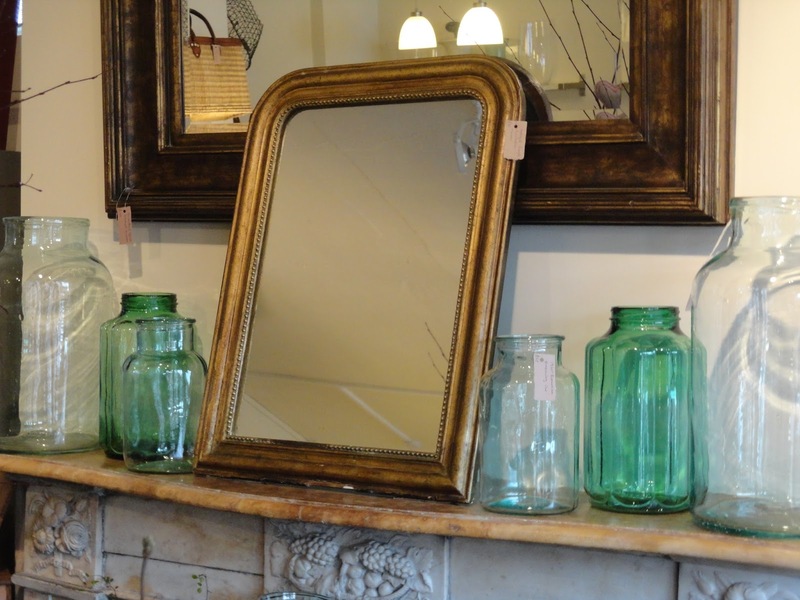 Beautifully clean and sparkling – a antique French mirror and Eastern European preserving jars. They make the best vases. Baby hare displayed amongst the gardenalia and some vintage style motoring signs and posters. 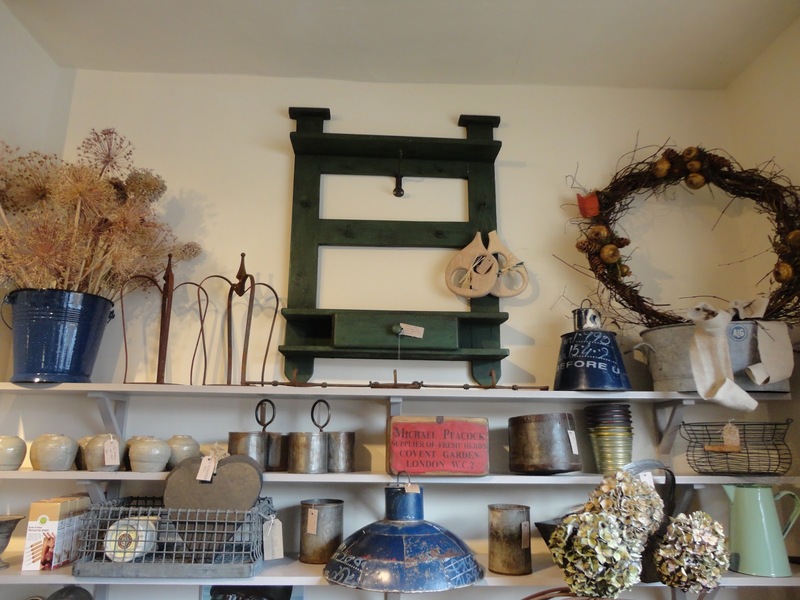 A mixed selection on the shelves – a pair of new crowns, two pot holders, antique rice measure and a Irish country shelf hook and drawer unit. 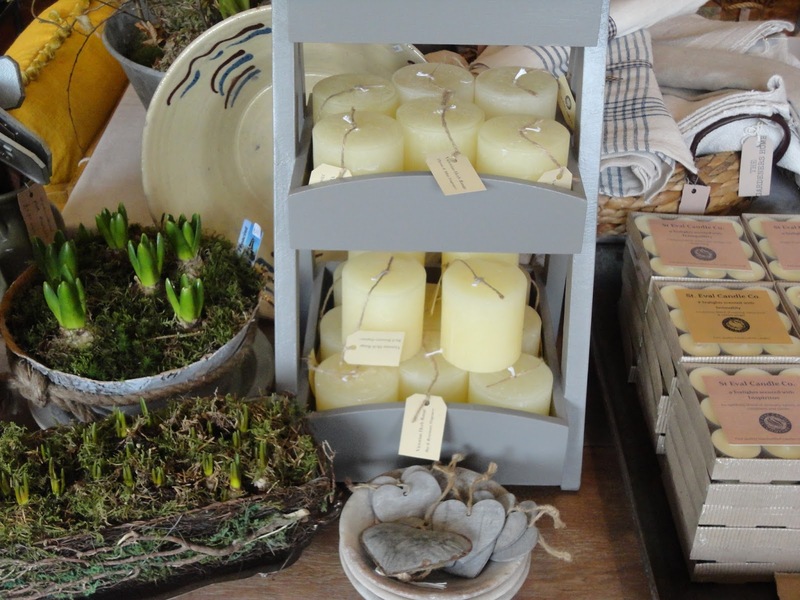 Please enquire about any of these items whilst they are in stock. 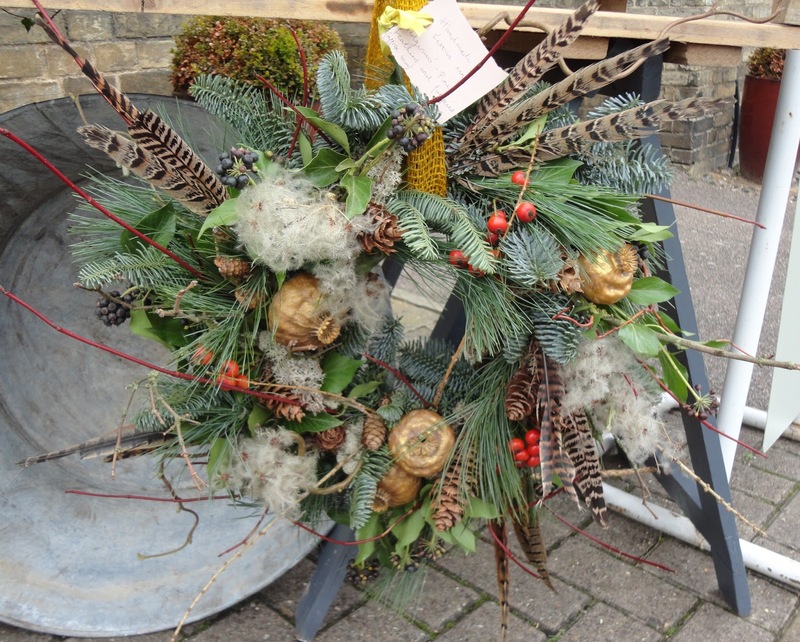 We are beginning to make our handmade Festive Rings for Christmas ready for sale from Thursday 1st December. A few examples will soon appear on our blog. 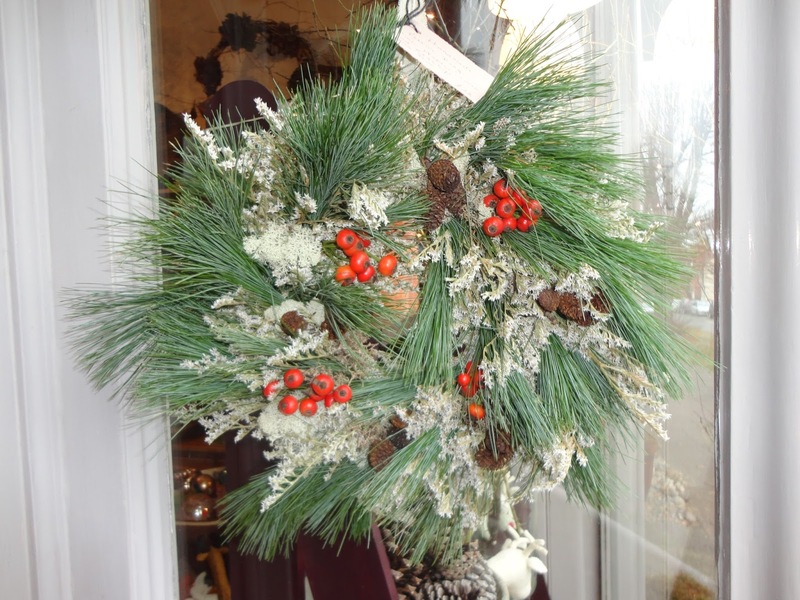 You can choose from the following creations; Hedgerow Ring, Berries & Fruit, Pine & Cones and Hydrangea & Ivy mix. 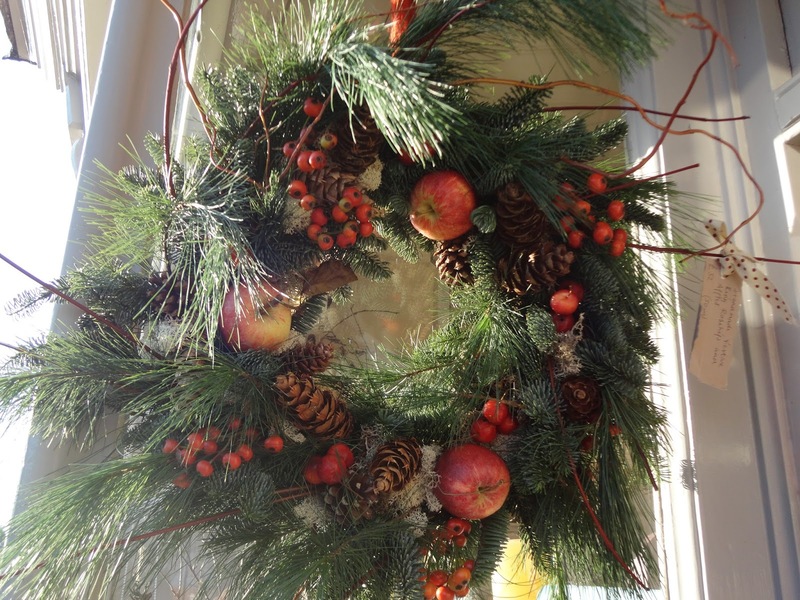 All our Festive Rings are unique, we select foliage which is fresh and mostly local. Some foliage may be substituted for similar due to limited supply. 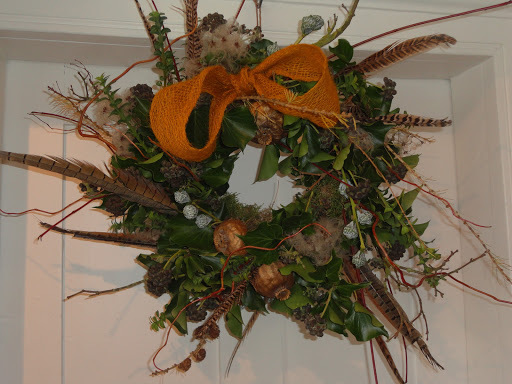 Hedgerow Ring – Fruiting Ivy, Eucalyptus pods, Salix sticks, pheasant feathers, giant Poppies and larch cones. Available in 40cm, 50cm & 60cm diameter. Priced from £38. 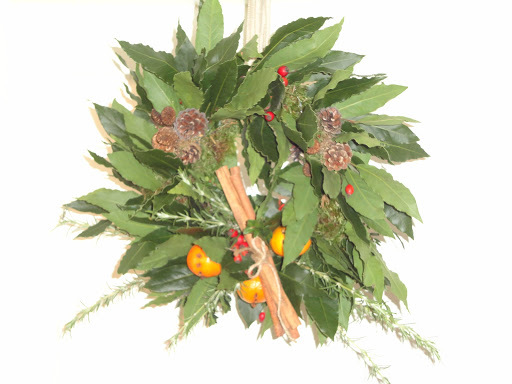 Berries & Fruit – A full ring made of scented Bay leaves decorated with Clementines, spices and Rosehips. 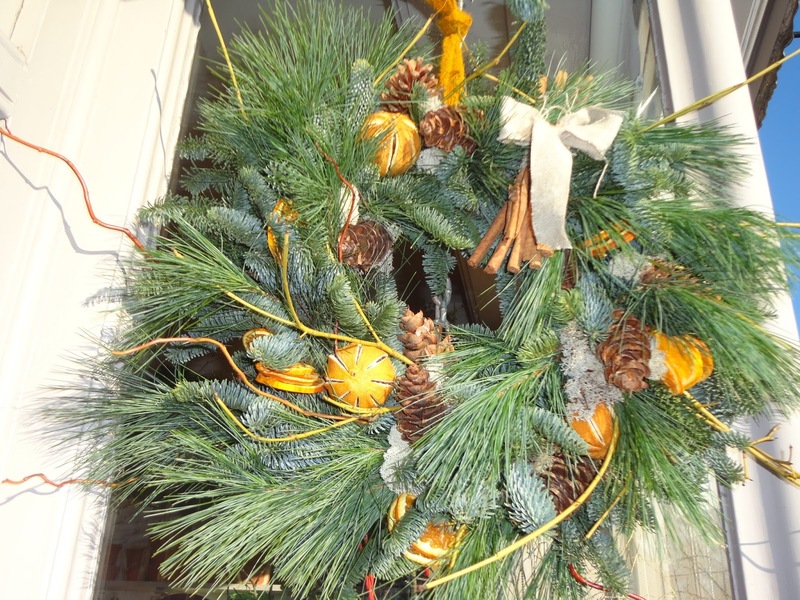 Available in 30cm, 40cm, 50cm diameter. Priced from £24. More photographs soon to appear. 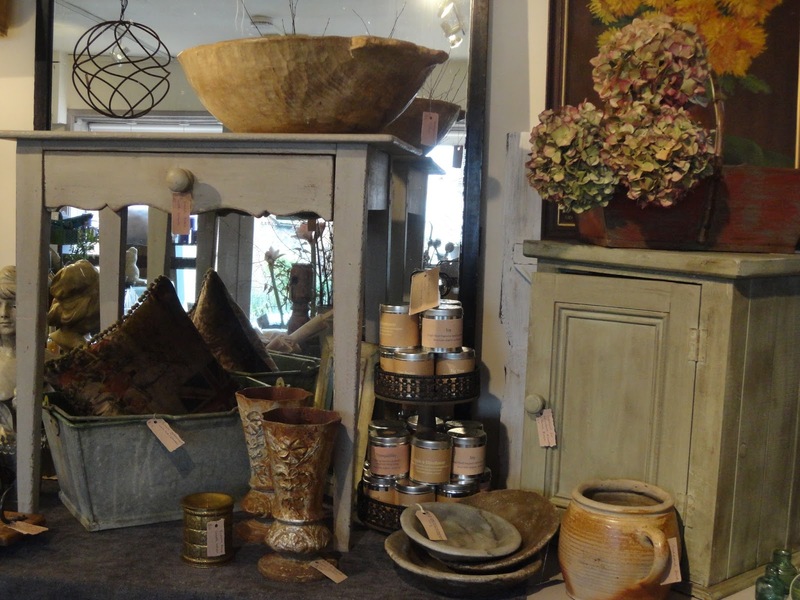 In this picture we have some beautiful ochre colour linen cushions arranged with a large stone urn displayed with a large rusty metal hare, a Hungarian hook and shelf wall unit, a lovely green stilton cheese bowl filled with our velvet pears made with spices. 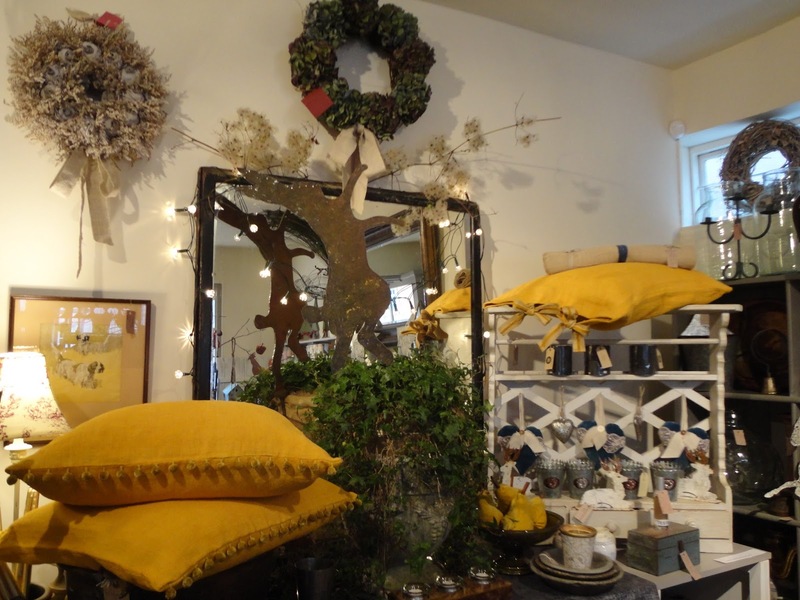 Seen on the back wall, a couple of our everlasting rings made with Hydrangeas and a generous linen bow and on the left, a ring made of giant poppies and statice. 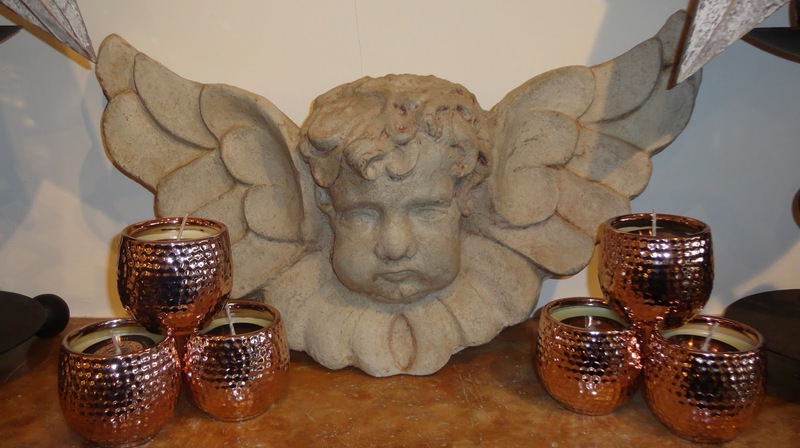 This stone cherub is a cast copy from a Victorian original. 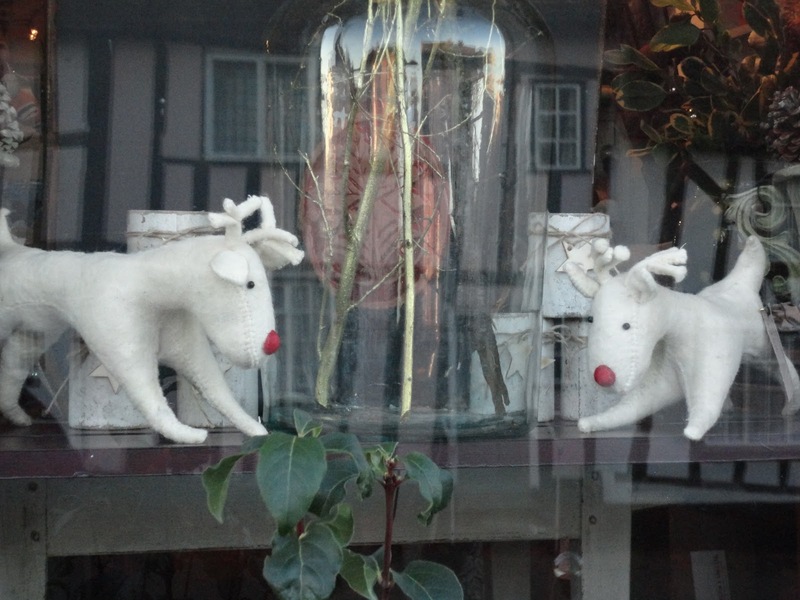 Decorative for both inside and out. 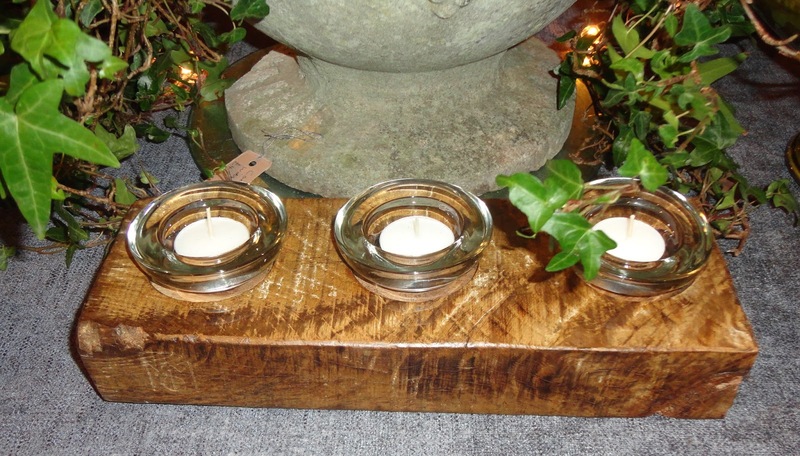 A close up of a tea light tray made from a very old piece of French oak. 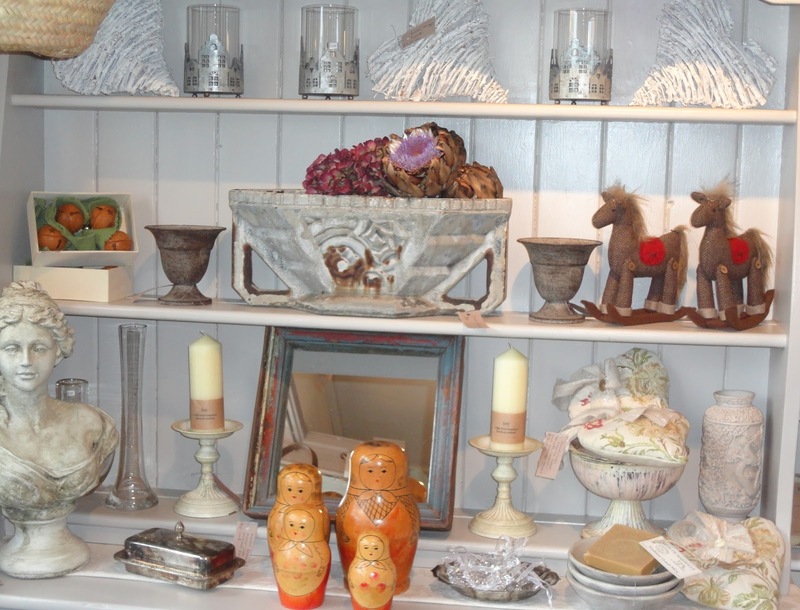 Display on the dresser: a French jardinière, a wooden framed mirror in original paint, new marble bowls, a unusual set of wooden Baboucha dolls and on the top shelf zinc candle votives and twiggy hearts. 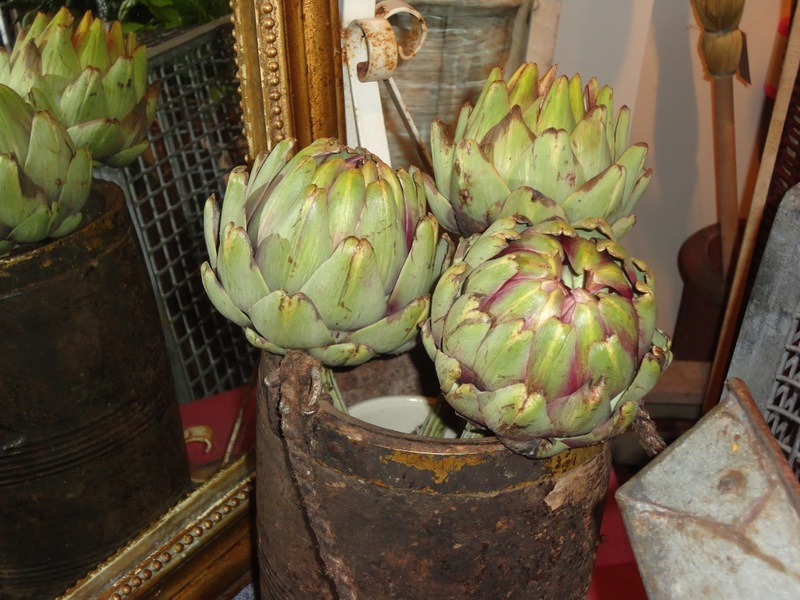 Globe artichokes displayed freshly cut. 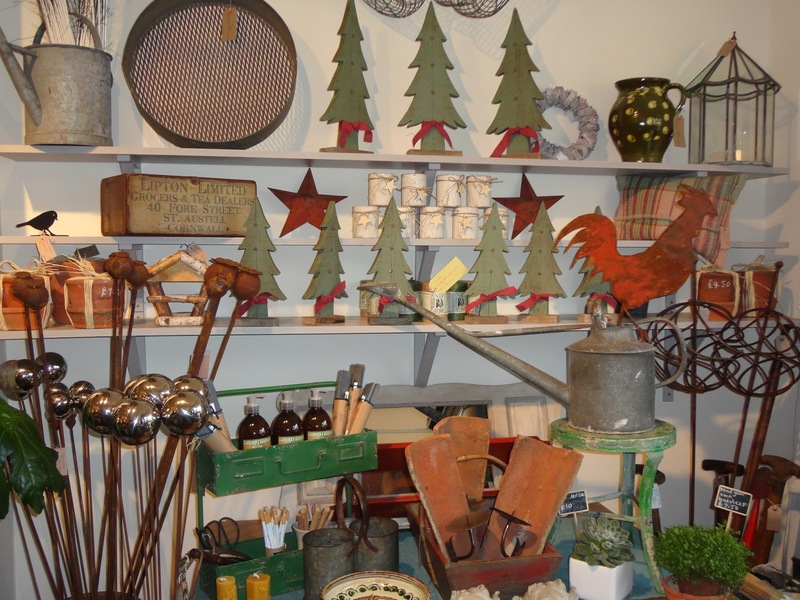 In the garden corner there is a mix of items including; French wall sconces, a French trug, vintage watering cans, decorative garden stakes, birch tea light holders, Amish stars, a handcrafted cockerel, green Christmas trees and lots more. 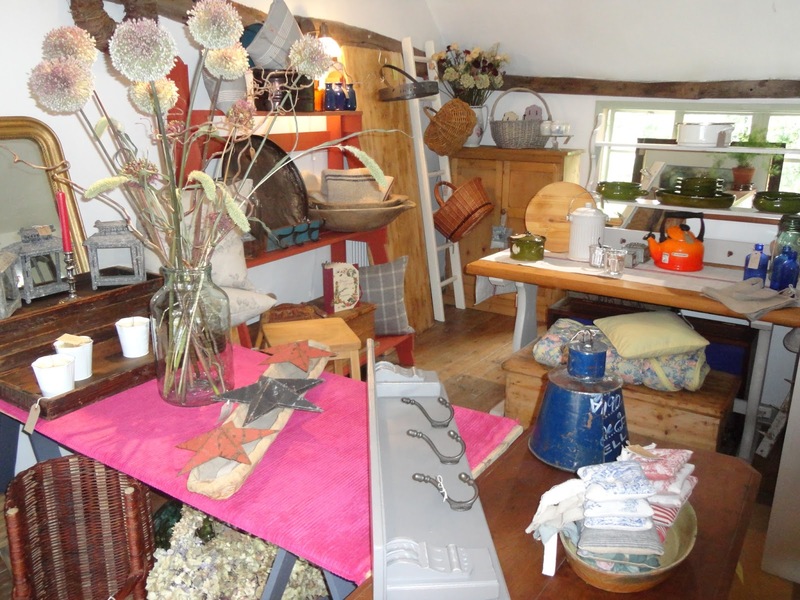 All our hand picked items are mostly one – off pieces and are often not seen again in the shop. 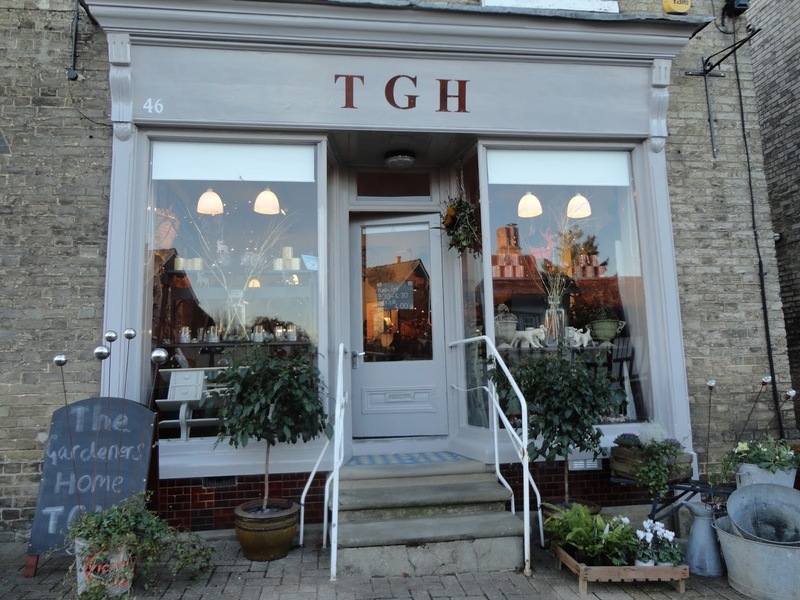 Great for gifts and mostly very practical items for everyday use! Just made today. 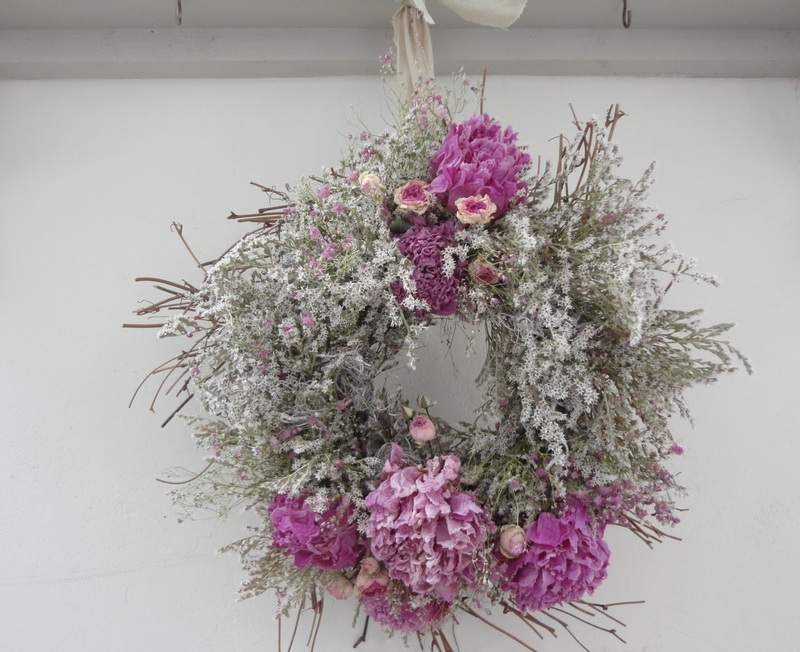 Everlasting Peonies, Gypsophila and Sea Lavender. 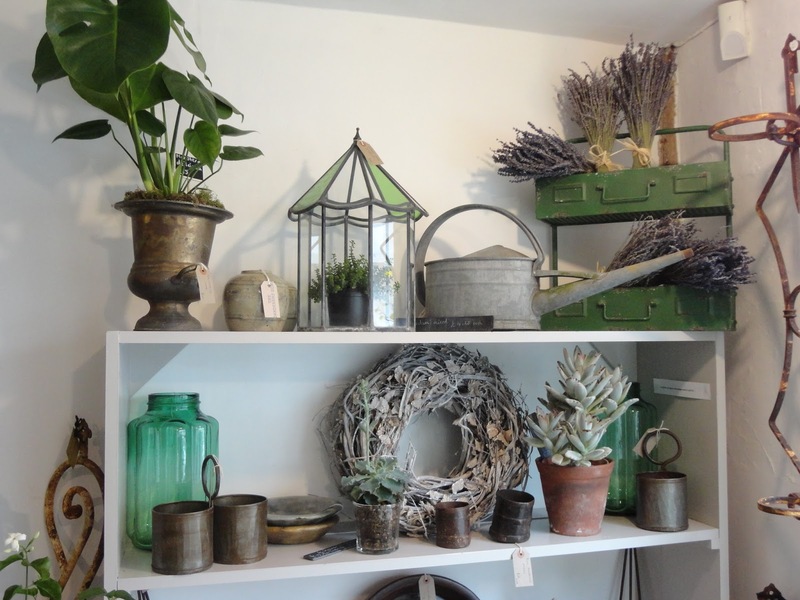 Some new purchases in the shop, an old glass terranium, Swiss Cheese plant and succulents. 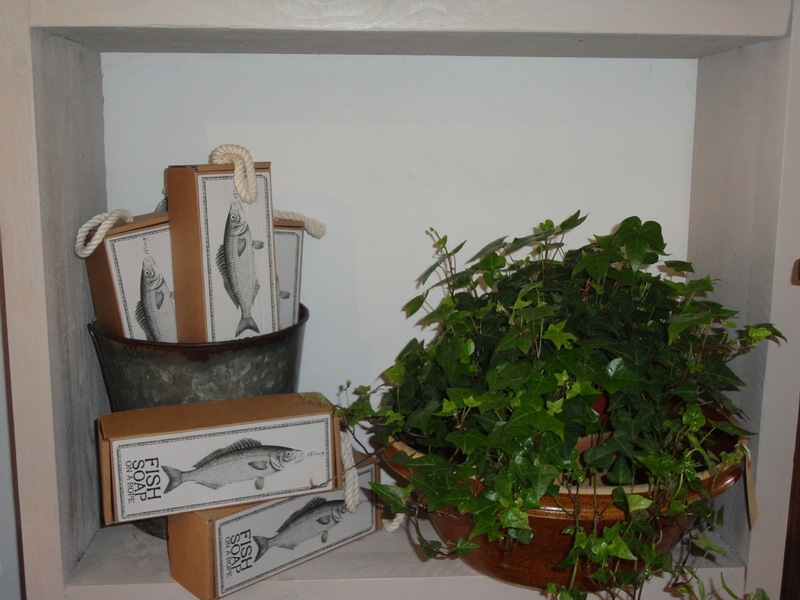 Something new to try is the fish soap on a rope. 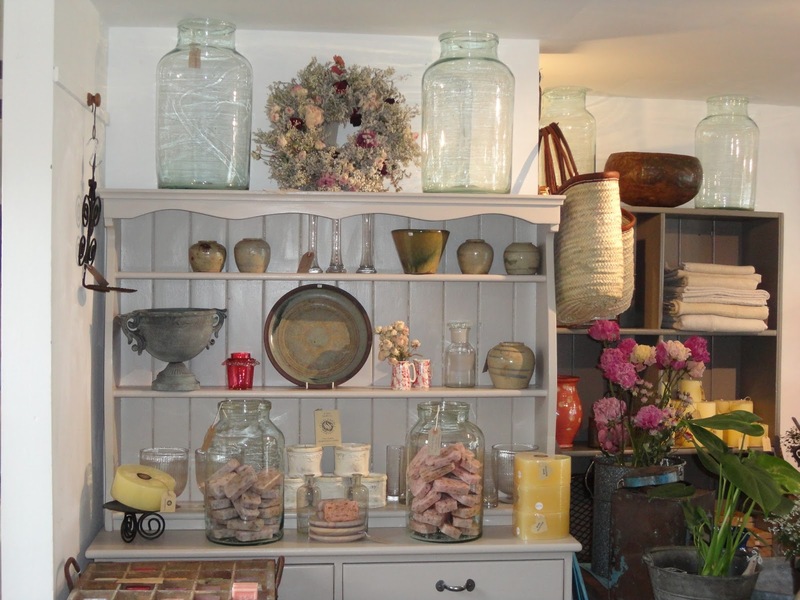 Our dress displays small pieces of new and vintage glass with old pottery pots and our favourite French soap, Lavender broyee and Rose petal. 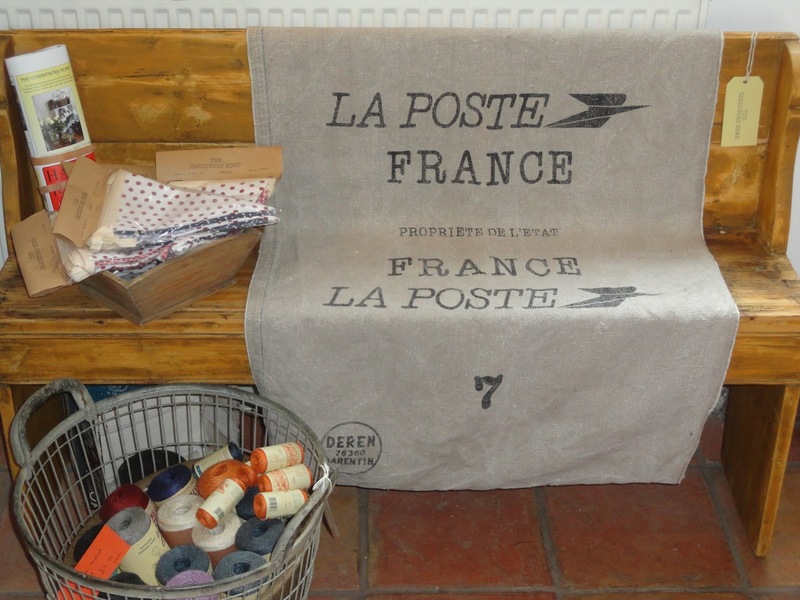 In great condition is this old French post sack displayed on a small Hungarian bench. 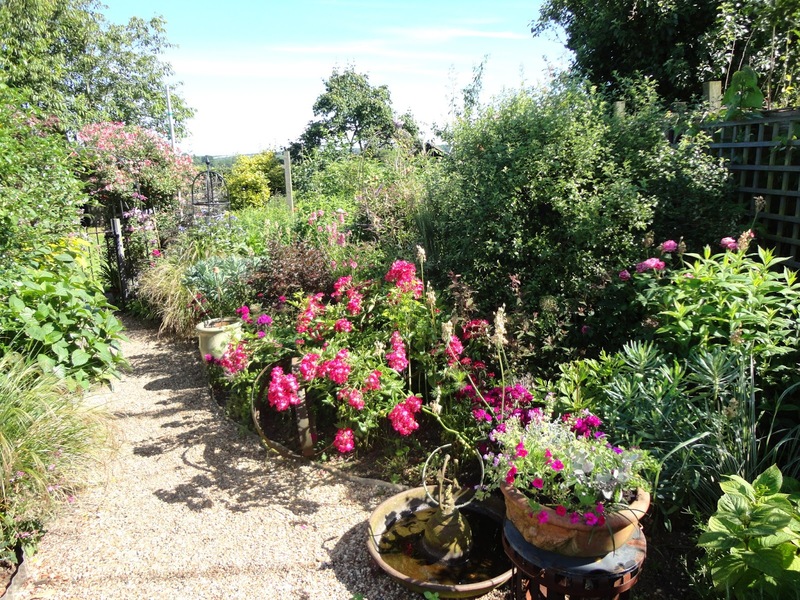 Our garden is now beginning to show some beautiful colour. 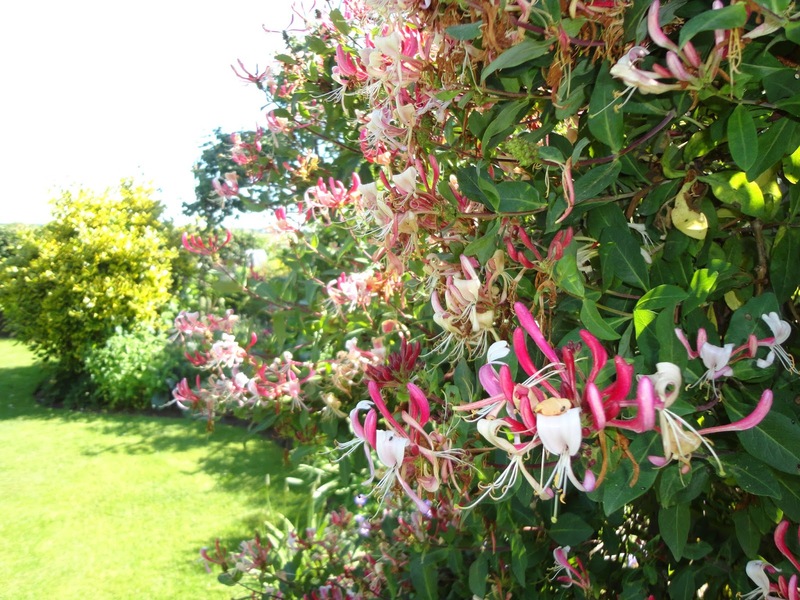 The Honeysuckle just keeps on flowering (L. Serotina). 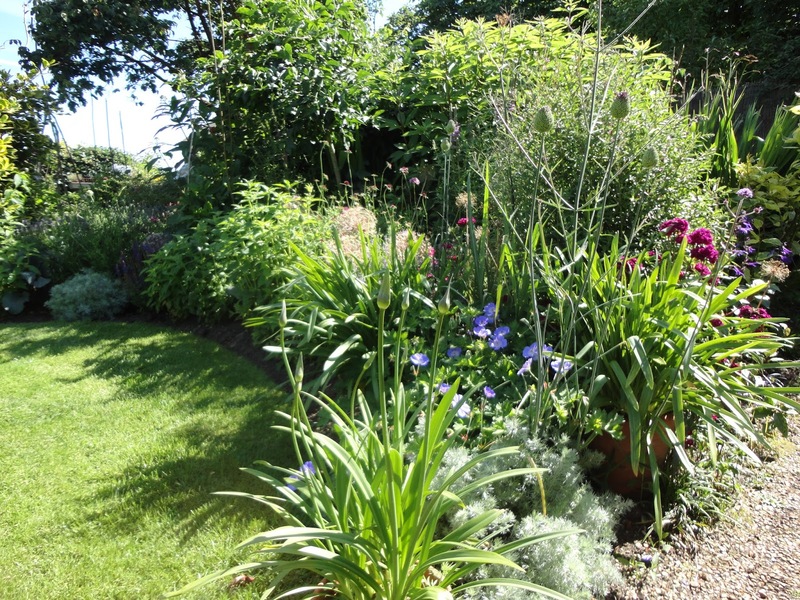 Some changes to the bed this year includes removing the Lavender edging to make way for more plants!!! 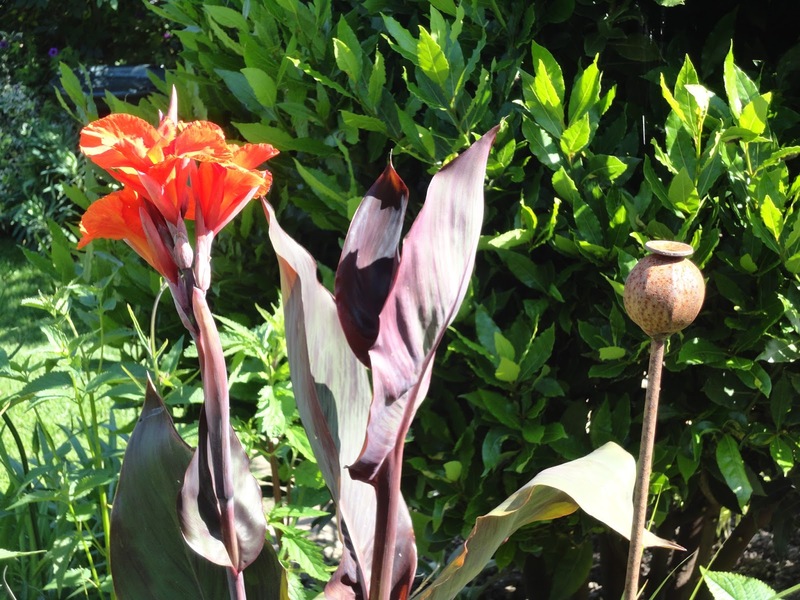 And finally for a bright splash of colour is the Canna, seen here with the rusty poppy stakes which still remain the best seller in the shop year round.